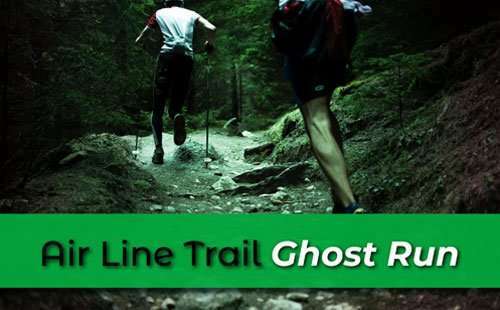 Please check back soon for updates on the 17th Annual Air Line Trail Ghost Run! The Parks & Recreation Departments of Hebron, Colchester, and East Hampton are collaborating along with the State of CT Department of Energy and Environmental Protection to host our 16th Annual Ghost Run – On our beautiful 13.1 mile certified half marathon course. The first 375 registered runners will receive a long sleeved t-shirt. If interested in volunteering for this event or if you need more information, feel free to contact any of the Parks & Rec offices; Hebron 860-530-1281, Colchester 860-537-7297 and East Hampton 860-267-7300. Relay Runners: Shuttle buses will drop you off and pick you up at designated locations. Relay schedules for shuttle buses will be available the day of the race. Shuttle Buses: If taking our shuttle bus service we ask that you park at the finish line, Center Elementary School, Main Street, East Hampton and take the shuttle to the start, Hebron Elementary School for check in or registration. Shuttles will run every 15 minutes beginning at 7:15 AM. The last shuttle to the starting point will leave promptly at 8:30 AM for the 9:00 AM start. Please note: Only pre-registered runners should take the 8:30 shuttle. Runners registering at the start line should take and earlier shuttle.